An air mass is a large body of air that, at any one height, has a relatively steady temperature and moisture content throughout. Air masses typically cover areas ranging from hundreds of thousands to millions of square miles. A front is the boundary at which two air masses of different temperature and moisture content meet. The role of air masses and fronts in the development of weather systems was first recognized by the Norwegian father and son team of Vilhelm and Jacob Bjerknes in the 1920s. 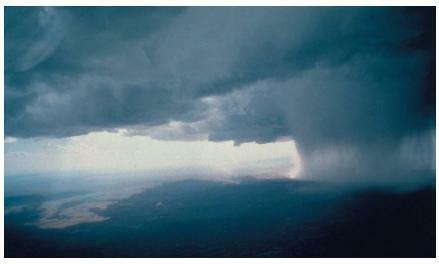 These two phenomena are still studied intensively as predictors of future weather patterns. Air masses form when a body of air comes to rest over an area that has an unvarying topography, or consistent surface features. Deserts, plains, and oceans typically cover very wide areas with relatively few topographical variations. In such areas, called source regions, large masses of air can accumulate without being broken apart by mountains, land/water intersections, or other surface features. A stable atmosphere, in which high winds are absent, is also necessary for the formation of an air mass. forms over land or sea and therefore suggests, the relative amount of moisture in the mass. The two designations are c for continental (land) air mass and m for maritime (water) air mass. A second letter, written in upper case, indicates the approximate latitude (and, therefore, temperature) of the region: A for arctic; P for polar; E for equatorial; T for tropical. The two letters are then combined to designate both humidity and temperature of an air mass. An air mass that developed in a source region over a large body of tropical water would be labeled mT (water, warm). An air mass that developed in a source region over an arctic land-mass would be labeled cA (land, cold). Air masses create weather as they are moved by winds around the globe. Fronts develop at the boundary where two air masses with different temperatures—and, usually, different humidities—come into contact with each other. The term front was suggested by the Bjerkneses because the collision of two air masses reminded them of a battlefront during a military operation. Continental: Referring to very large land masses. Maritime: Referring to the oceans. Topographical: Referring to the surface features of an area. Cold fronts. A cold front develops when a cold air mass moves into an area occupied by a warm air mass. Because cold air is heavier or more dense than warm air, the cold air mass moves under the warm air mass. Cold fronts are usually accompanied by a decrease in air pressure and the development of large cumulus and cumulonimbus clouds that bring rain showers and thunderstorms. Rainfall and winds are most severe along the boundary between the two air masses. Cold fronts are represented on weather maps by solid lines with solid triangles. The direction in which the triangles point shows the direction in which the cold front is moving. Warm fronts. A warm front develops when a warm air mass approaches and then slides up and over a cold air mass. As the warm air mass comes into contact with the cold air mass, it is cooled and some of the moisture held within it condenses to form clouds. In most cases, the first clouds to appear are high cirrus clouds. Some time later, lower-level stratus and nimbostratus clouds form, usually bringing widespread rainfall. Warm fronts are designated on weather maps by solid lines with solid half circles. The direction in which the half circles point shows the direction in which the warm front is moving. Occluded fronts. A more complex type of front is one in which a cold front overtakes a slower-moving warm front. When that happens, the cold air mass behind the cold front eventually catches up and comes into contact with the cold air mass underneath the warm front. The boundary between these two cold air masses is an occluded front. Clouds form along this boundary, usually resulting in steady and moderate rainfall. An occluded front is represented on a weather map by means of a solid line that contains alternating triangles and half circles on the same side of the line. Stationary fronts. In some instances, the collision of two air masses results in a stand-off. Neither mass is strong enough to displace the other, and essentially no movement occurs. The boundary between the air masses in this case is known as a stationary front and is designated on a weather map by a solid line with triangles and half circles on opposite sides of the line. Stationary fronts are often accompanied by fair, clear weather, although some light precipitation may occur. i luv this site sooooo much. thnx 4 all the help!!!! WOW!!! THIS SITE HAS A LOT OF INFO THAT I NEED! THANKS!!!!!!!!!!!!! thanks for the information, this website if helping a lot in such away that we are easily informed of yhings which we were not knowing. I need to know what happens wen a cold air mass meets a warm air mass ? homework 2night !! I'm doing a science project on this! Does anyone have any ideas for a model or demonstration?? If any one has a model or demonstration; please share the information with me. thanks, i have homework 2nite! he he! thanks again! I love this site it helped me boost my science grade up! I need to know what type of precipitation occurs when warm and cold air mass meet. This site helped me with my homework a lot.Thank you! This helped me with my science project a lot. Thnx very much! The website informs a lot about science! This site was very helpful for my science project. Witch type of clouds are formed in Cold Fronts? I need to know asap im doing my homework. This webstite was really nice and great, thank you guys!